Happy, happy weekend! I hope that all of you had a great week and that your weekend is off to a good start. Tomorrow is the Super Bowl, which means lots and lots of menu planning! Are you throwing a party or making anything special for the big game? I’m planning to pop a loaf of the cheesy pull-apart bread in the oven and perhaps throw together a dip. Nothing too big or extravagant. What about you? 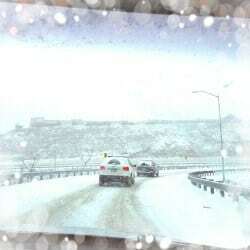 I hope you enjoy some time with friends; stay safe if you’re in the path of snow this weekend! 105 Super Bowl Recipes – If you’re still figuring out your Super Bowl menu for tomorrow, look no further! 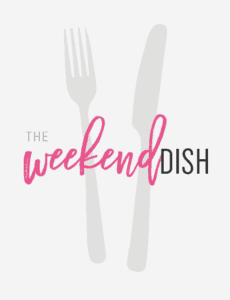 I’ve got you covered with appetizers, snacks, sweets and meal ideas! 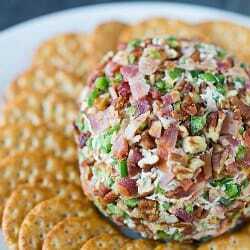 Bacon-Jalapeño Cheese Ball – A cream cheese-based cheese ball loaded with cheddar cheese, bacon, jalapeños and tons of flavor. 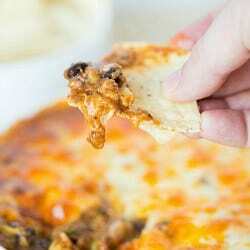 Warm Black Bean Dip – A fabulous hot black bean chipotle dip that’s smooth, cheesy and spicy. Perfect party food! Cheesy Pull-Apart Bread – Talk about the ultimate bread! 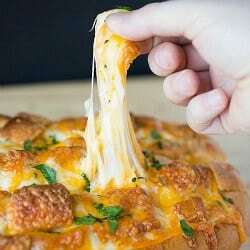 Garlic bread gets smothered in cheese and baked in the oven. Irresistible! Friday Things – Snow, planners, sleeping dogs, burgers and more! Bacon, potatoes and a spicy sour cream dip? Yes to all! This reminds me of Texas Sheet Cake, but made in a skillet. Looks so delicious! This dip has my name written all over it. I’ve had the chocolate chip cookie dough dip… I can only image how infinitely better it would be with peanut butter and miniature peanut butter cups. Maria always hits home runs with cookies, and these look totally amazing. Love the combination of salted caramel and chocolate! Yes, please! I’ll take the whole thing! Congratulations on your exciting news, we want to see a picture of the two of you together, we have heard you speak of him so often, now we want to see him in the flesh. I so enjoy your blog and receipes and I have served so many of them to my faculty at school and they rave about them. Enjoy your life to the fullest, it goes by so quickly. I am somewhat new to your blog. I am completely hooked, your recipes never disappoint. So, I’m just curious…when are you doing a cookbook?! I really hope you are thinking about doing one (unless I have totally missed something and you already have). Thank you, thank you for making me a better cook and baker! Hi Kate, I’m so happy to hear you’re enjoying the site! I do not currently have a cookbook out, but stay tuned! Love your blog and everything I have made is delicious! I always like to see the most e-mailed, most pinned recipes, etc. 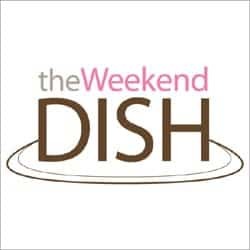 on your weekend dish. Are you not gonna post this any more? Hi Debbie, Oops! That section somehow got omitted this week; don’t worry, I will still be featuring those! There’s a big game this weekend? I’m stuck at my daughter’s swim meet, I would never have known ;) Thanks for the shout out on my Reese’s Dip! Happy Super Bowl Sunday! What team are you rooting for? 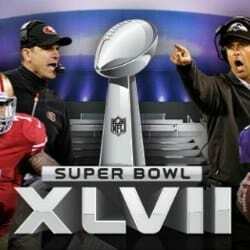 It is all about the San Francisco 49ers here. Gotta love a former Michigan Wolverine as the coach! I was rooting for the 49’ers! Bummer! I know! So disappointed that they could not get in the end zone on 4 tries at the end which would have won the game! Oh well…there’s always next year since this is a young team! Happy Super Bowl Sunday! Enjoy the game and thanks for the cookie shout out! Two best things I made this week were the Deep Dish Pizza Casserole from The Chew Cookbook and turkey chili with black beans and buzz from Portia Little’s Cooking with Coffee Cookbook over Cornbread Waffles. Hubby said I should be on TV! No Super Bowl party, but I will be cooking away! Going to Vegas later this week and I need to leave my Husband with some food so he will eat, plus blogging! Enjoy the big game!! The best thing I ate this week was a plain and simple chicken sandwich but the chicken was freshly poached and the bread was an amazing loaf freshly out of the oven and made by my wonderful husband. Bit of mayo, bit of salt. Delicious. Best thing I ate this week was a cheesy quesadilla with refried beans and a little garlic salt. How very basic yet so so good. I just found your blog this week and absolutely love it. It is such a good mix of comfort foods and melted cheesy things (my favorite) and good sweet stuff with peanut butter. I can’t wait to try a few in the weeks ahead. And I love how simple and clean and easy to navigate your blog is! I nominated you for the Homies award for the recipes + photography. Keep on inspiring! I bookmarked Aimee’s Reese’s PB Cookie Dough Dip too. My husband has to supervise extra duty tomorrow (yay army! ), but we’re not too bummed…he isn’t a football fan and my team (Vikings) isn’t playing, so no party or watching the game for us. No big plans for the Super Bowl here. Just looking forward to the commercials and halftime.